What Is A Serum – and Do I Need One? In recent years, the Serum has come on the market and many of you say you are playing catch-up in learning of its value. Before you ask, “What’s in it for me?” Ask yourself . . . If the answer to this question is NO, try adding a serum to your daily skin care routine and see – and feel – the difference. A serum is a skin care product with the consistency of a gel or light lotion and with a higher concentration of active ingredients than a traditional moisture cream. ~ Serums are meant to be used under your moisturizer. 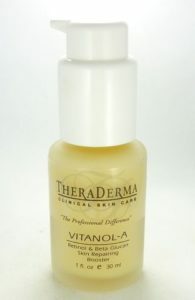 ~ Serums do not replace your moisturizer – they are meant to enhance it. 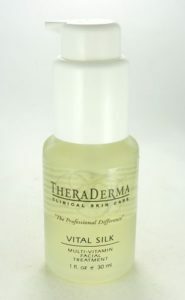 ~ Serums contain molecules smaller than those in a moisturizer an so penetrate deeper. ~ Moisturizers are richer than a serum and create a protective barrier on top of your skin, locking in your serum’s potent ingredients. Everyday our skin is bombarded or damaged by sunlight, air pollutants, cigarette smoke, stress and the drying effects of alcohol consumption. ANY ONE OF THESE can set off free radical damage to your skin, breaking down collagen, speeding up aging and even contributing to skin cancer. The right serum can help protect you! Combining the RIGHT SERUM and MOISTURIZER will give your skin a smoother texture and help refine the size of your pores. And don’t forget to add a SUNCREEN to this combination before going outside! A common misconception about serums is that more is better. Because serums are typically very concentrated, a little goes a long way. ALSO: If you have a chronic skin condition such as eczema or rosacea, serums may cause aggravation. Ideal for all skin types: normal-combination, dry-mature, oily-acne and delicate-sensitive. 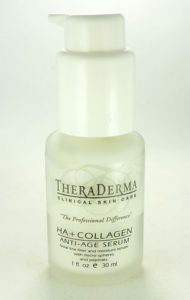 Aids Collagen production – collagen is the gel that holds skin tissues together and we lose it as we age. Free radical defense. 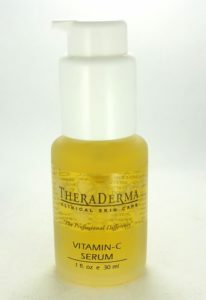 Dark spots or a blotchy complexion can be reversed with the L-ascorbic acid contained in Theraderma Vitamin C Serum. Ideal for non-sensitive skin types environmentally damaged and beginning to show signs of aging. This serum forms a breathable moisture seal and helps to achieve a smooth and even application of makeup. An exclusive Multi-Vitamin Facial Treatment, it provides pollution protection with an essential amount of Vitamin C, just the right concentration of Vitamins A and E, and also beneficial minerals and extra pure essential oils. Ideal for all skin types: normal-combination, dry-mature, oily-acne and sensitive- delicateThis nourishing antioxidant stimulates collagen and elastin production to firm and rejuvenate the skin cells. Refines skin texture and brightens skin tone. Vitamin A (Retinol) is light sensitive so best to use before bedtime. Excellent treatment for dry aging skin. If you have age spots, fine lines or dryness, try adding a serum to your daily skin care routine and see – and feel – the difference. If your skin is very oily, a serum can give you enough hydration that you won’t even need a moisturizer.Re-plumps and fills in wrinkles with HA – Hyaluronatic Acid microsphere sponge technology. Dehydrated for greater penetration, these spheres are “micro-injected” into the tissues where they swell up with water and increase in volume, resulting in smoother and more hydrated skin. The HA provides continuous moisture to the skin by binding up to 1000 times its weight in water. WORTH A TRY? YOU DECIDE. Ask anyone already using a serum and she will tell you that you have nothing to gain but more beautiful skin. This entry was posted in Anti Aging serum, Best Serums, Dry Mature Skin, Oily-Acne skin, Skin Care, Vitamin C serum on October 29, 2017 by admin.